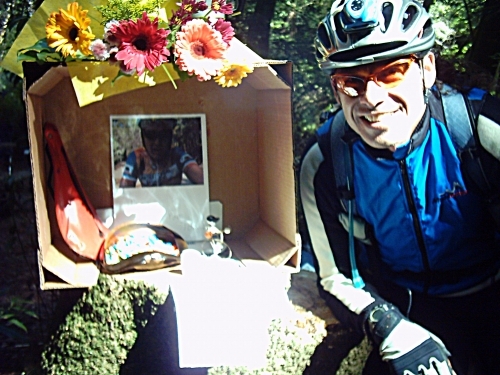 I read my own writeup from the same route for the previous year of the San Francisco randonneurs 600k and took my own advice, eat better, don't chase, and ride at a comfortable pace. I was not sure my mind and body were ready this time; I had not been riding too much and was feeling a little lazy, issues at work did not help either, I was not focused for this event. Fortunately the few rides I had done before this had been good. A new friend who had recently joined us on our Mixed Terrain rides and who is far faster than me had me trying to keep up with him on some nice rides. With just a couple of weeks left before the ride I rode from San Francisco to Occidental to spend the night and meet the wife. Right at the Bohemian Hwy turn after Freestone I had taken a wrong turn and added about 10 miles and near an hour to my total for the 2009 600k. I needed to know the right way to avoid the same stupid mistake. This was a good call on my part. No wine for a whole two weeks, early to bed, and a decent diet. Had also been running between 6 and 13 miles on trails on Sundays; that gave my body, I think, a chance to get used to hard efforts. 20% rain chance for most of the route on Saturday wasn't bad, I had no real excuse to stay in bed instead of going on a 600 kilometer ride. As always by 6:00 we were moving on the east sidewalk of the Golden Gate Bridge. I joined the front group. We rode to Point Reyes Station at a good pace, not fast nor slow, I was feeling fine but knew from here to Petaluma I had to pace myself even more. I was the first rider out of Point Reyes Station and for a surprisingly long time I rode alone until the group of 8 riders caught up with me near the top of the hill before the Cheese Cake Factory. 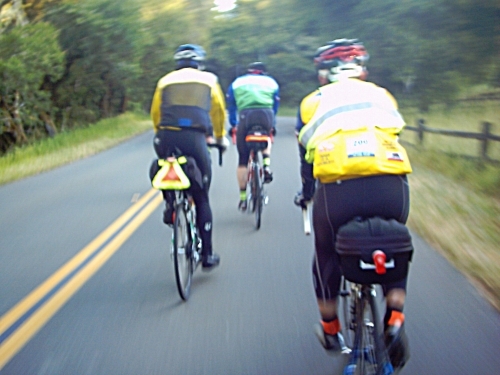 I had been riding at a very relaxed pace and was rested but still the group left Richard M, Keith B. and me behind. I waited just a little for Richard and we rode together to the Petaluma Safeway were the rest of the group was still getting ready to go. We were able to leave all together which was a huge deal as the next section to Healdsburg tends to be windy and can drain a fresh set of legs in no time. However, I also had another card up my sleeve. Earlier this year I did the 300k route mostly alone with the purpose of learning to deal with this section alone if I needed to. No need to do that today but it was definitely comforting to remember that solo experience. Ernesto M. was setting a brisk pace and even had the energy to play the sprint to city limit signs game with Peter M. Keith B also joined in the game and all this playfulness made the miles go by faster. Leaving Santa Rosa (I think) Masa K. had a flat. We all waited and resumed riding as a group. Once at the Healdsburg Safeway I got soup and gatorade, however half way through the soup the group decided it was enough and all started to move. Masa, Richard and I struggled for 2 miles to catch up, some energy wasted. Fortunately I had a few bottles of Ensure with me so just opened one and drank its contents. We rode as a happy family to Cloverdale and then continued on to climb Hwy 128. A long winding and sometimes steep hill. Not too bad but still hard work after 108 miles on the legs. The group split fast, again Richard and I in the back, a little further Keith. I was on my own for a while, all the way to Yorkville where I saw Richard walking outside the only town store. I stopped and asked him if he was leaving right away, "no". Great! I'll have company on the next 40 or so miles to the Dimmick campground, the location of our drop bags. Keith arrived while I was in the restroom, we drank and ate a snack and continued on our way. Keith dropped a little and Richard and I continued into the head wind. Richard did a lot of the wind work I did the uphill pacing. Boonville and Philo came and went, freaking Navarro took for ever to appear. Once a canopy of trees started growing over our heads the front wind was not as bad. Our star volunteers, Bruce B., Tom and Alayne H and Jack H. were at Dimmick park waiting for us with a whole set of food and drinks. Your warm welcome was very comforting thank you! After a stop we were on our way to Ft Bragg. a psychological milestone on this ride, at least for me. Head winds were still waiting for us at Hwy1 where we rode North while hugging the beautiful California coast. The first part of this segment sees many rollers, after Mendocino it all changes to a mostly straight line road with few real elevation changes, although it seems you are climbing a little. We crossed paths with Peter and Jon when we were about 4 miles from the Control. Just blocks from the Control we also saw Ernesto, he was riding alone the return leg to Dimmick. Masa, Geoff and Vidas were still at Safeway when we arrived, we tried to be efficient at this stop and managed to use the restroom, eat something and even rest a few minutes before we rejoined Hwy1 going South this time. An ugly head wind was now a loved tailwind. We stopped once to check Richards's gears, something had not been working right for a while. We started to see riders going in our opposite direction towards the Control at the Pt Reyes Safeway. Exchanging greetings with all of them from across the hwy, Judging by the look on their faces some riders were having a hard time, some were really enjoying their ride. We arrived at Dimmic where some of the riders ahead of us were having dinner. We proceded to change into a clean and fresh set of clothes, replenished the bike bags with new provisions, had dinner and barely rest. It took us about an hour to leave Dimmick, most of the delay was me using the restroom and getting my stuff ready. Thank you guys! to the volunteers and out we went into the night. Love night riding. About 50 miles from Dimmick park to Cloverdale, many of them climbing. I was feeling very fresh and we were moving efficiently. At Boonville made a quick stop and continue into the clear night. The temperature was pleasant, a little cold but apparently not as cold as what others that came this way later in the night experienced. I was ahead on the hills pacing the climb, we had a clear view of the big moon and starry sky. This was a one of those Randonneuring nights you remember. At the top of the last major hill we stopped for a break and noticed Richard's saddle was loose. Good thing he noticed it there in time to get it fixed before it became a real issue. Almost all downhill to Cloverdale. The gas station mini-mart we chose to get our proof of passage receipt was cozy inside, plenty of junk food choices, machine coffee and more importantly, tables with relatively comfortable benches. After being there for a while a couple on a tandem arrived. We had been seeing them since Demmick (I think) they were riding probably 30 minutes behind us most of the route. The cashier said about 6-7 riders were ahead of us. Richard was now riding a little slower, he was feeling sleepy, it was only 10 miles to Healdsburg so we made a stop at that Safeway just for a short nap. 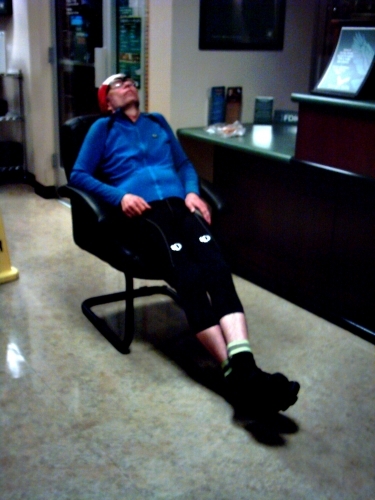 I found a very comfy chair used by the Wells Fargo costumers and sat for a minute or so until Richard appeared, offered the chair to him and he did good use of it, Since I was still feeling fine and fresh I did not want to close my eyes, a 5 minute power nap brought energy back to my partner. I used the time to email a status to the wife. The tandem couple came by the time we were getting ready to leave. We passed the comfy chair on to them. It was still "night" when we left but by the time we hit Hwy 116 we did not need the headlights anymore. Our next Control at the Guernville Safeway was just a few miles ahead. We took our bikes inside and were surprised to see Geoff and Vidas there. They had used a couple of hours of sleep at a motel in Cloverdale , getting their receipts before going to bed. After being there for a little while the tandem couple showed up. Richard, Vidas, Geoff and I left together. Climbing Bohemian Hwy to Occidental was not nearly as bad for me as it had been last year when I was exhausted at this point. 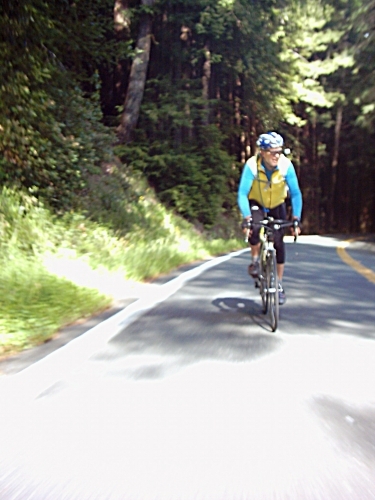 We rode straight to Tomales and then did a "peeling layers" stop before Marshall. I had been riding without a jacket all night and was still very comfortable but took off the vest and the neoprene booties. In no time we were at Point Reyes our penultimate Control. Straight to the Bovine Bakery we went and then enjoyed the lovely sun on the grassy area next to it. When we decided we have had enough of a great thing we started the cycling thing again. In the San Geronimo Valley my energy went down a bit and I felt tired for the first time. Fortunately we were very much within a couple of hours from the finish and on very familiar ground. We rode the last hills to the Golden Gate Bridge slowly. Vidas mentioned we would regroup at the bridge, when I got there he was waiting on the west sidewalk, Geoff was moving ahead and Richard was just behind me. It was almost 12:30. Geoff was trying to get to the final Control pacing us so I chased after him. We both got to the South side of the Golden Gate Bridge at the same time and my intention was to wait a few yards before the final Control, at the visitor gift shop for Vidas and Richard but once there I just rolled down. Vidas came within moments, Richard after that. I felt bad not waiting, my competitive spirit took over my randonneuring one, we should have rolled in together, my apologies to both of you. It was a great ride this time for me. Great company and weather.. 30 hours 29 minutes final time, I'm happy with that. Ensure does really works for me. I drank 10 or so of those things! Losing some weight due to better diet has helped my cycling. Trail running has helped me push my comfort level a little more. I am a little lazy sometimes and just don't push harder when I know I can and should (for improving conditioning) Trail running does really helped here. New wheels are nice to look at. Wool and plastic (synthetic fabrics) are best friends when they are together. I always use many layers, this time as in the past, used two plastic base layers, and two wool layers on top of them and then added a plastic vest for night/cold riding. I was never cold. Never wore a jacket. Double shoe covers this time. Used the little half shoe (toe) covers with "improvements" all the time and when cold/night added the full booties on top of them. Very comfortable feet all the time. "I was not sure my mind and body were ready this time; I had not been riding too much and was feeling a little lazy, issues at work did not help either." caught my attention as I'm in the same boat for next weekend's 600k here in Minnesota. Done a few 200's and many 60-80 milers this summer so I'm a tad tentative about doing such a monster ride. What kind of mileage did you do prior to your 600?